Here at Maude & Fox we specialise in making contemporary tweed clothing for men and women. But every now and again we get a customer with four legs instead of two, as this photo taken at the recent Chatsworth Country Fair above shows. 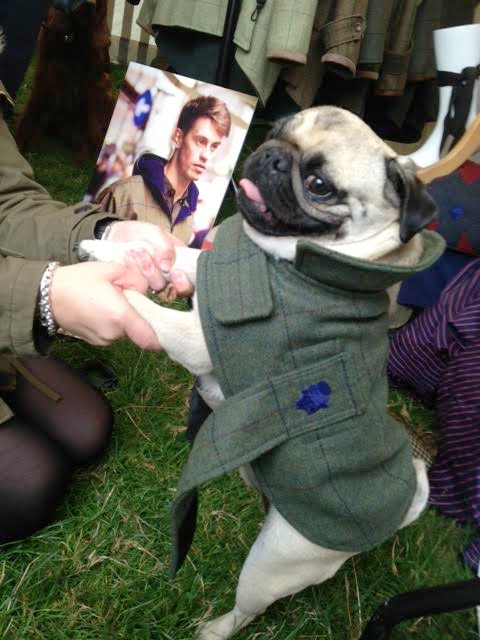 So if you would like your dog’s outfit to compliment your own tweed ensemble then we’re more than happy to help. We are pleased to announce that our flatteringly fitted Fly tweed jacket is now available online in our ladies country clothing collection. 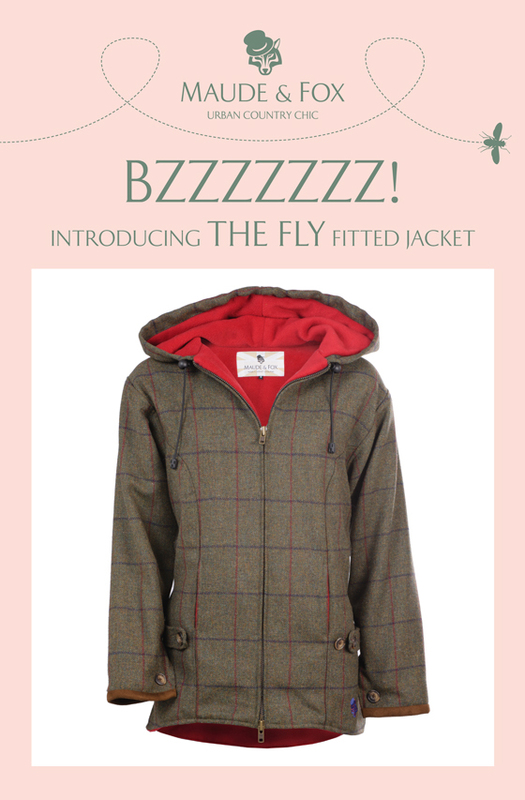 Our brand new ladies Fly jacket caused quite a buzz when we launched it at the recent CLA Game Fair. The Fly features a beautiful slightly fitted shape for ladies which suits any size. Tabs at the side allow the jacket to pulled in at the hips if required. With its long zips, little hand warmer pockets and warm fleece lining it ticks many style and practical boxes. A must have for autumn winter and spring. The Fly is also available with a fur hood for an even more luxurious feeling. Here’s a sneak peek at our soon-to-be launched Patriot Messenger bag. Our Patriot Collection is proving very popular at the moment. 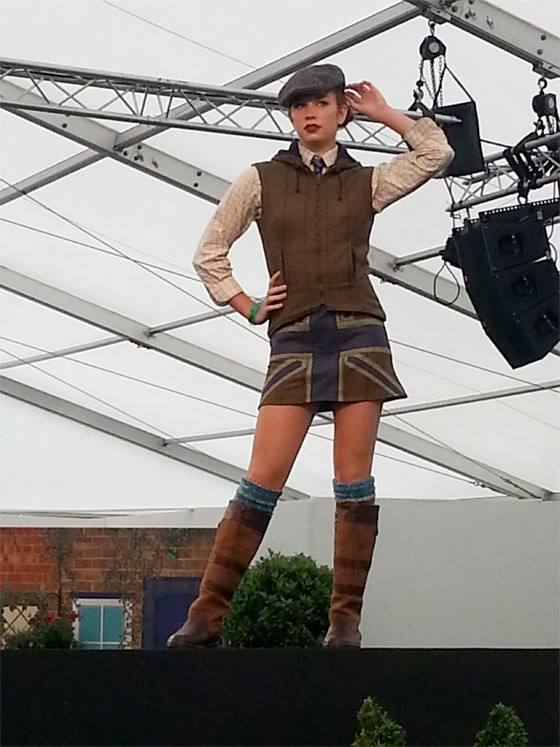 We certainly had quite a few enquiries following the CLA Game Fair Fashion Show where this picture was taken. You can see another picture of a bespoke Union Jack messenger bag we made for a customer here. The Patriot messenger bag will retail at £130 and will be added to our website in the coming weeks. If you want to be one of the first to place an order for our new Patriot Messenger Bag you can call our Dorset studio on 01258 489 628. Alternatively you keep up to date with all our latest news via Twitter. 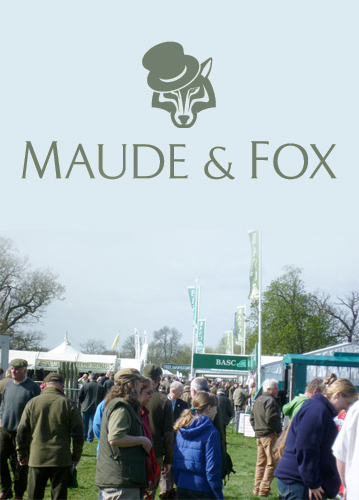 As Maude & Fox fans will know we not only had a stand at this year’s recent CLA Game Fair. 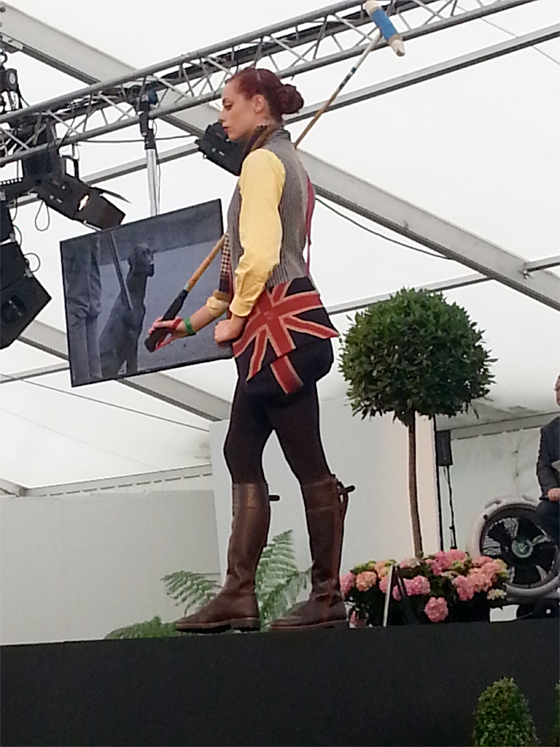 We also helped support the daily CLA Game Fair Fashion Show, supplying items from our contemporary clothing collection. The model pictured above is wearing our Union Tweed Skirt. Unashamedly British, the skirt sports the Union flag in cool Britannia colours, appliquéd onto tweed. It’s worth noting that the stylist had hiked the skirt up for the fashion show, but as we make them to order in our Dorset studio, you can choose yours just as long (or short) as you’d like it to be! More information on the Union Tweed Skirt click this link. We also make another version in red. Teaming up with the skirt is our fitted 100% British tweed Foxy Sports Gilet. More pictures of the gilet are available here. Other items from the Maude & Fox collection that featured on the catwalk included our Patriot Bag. 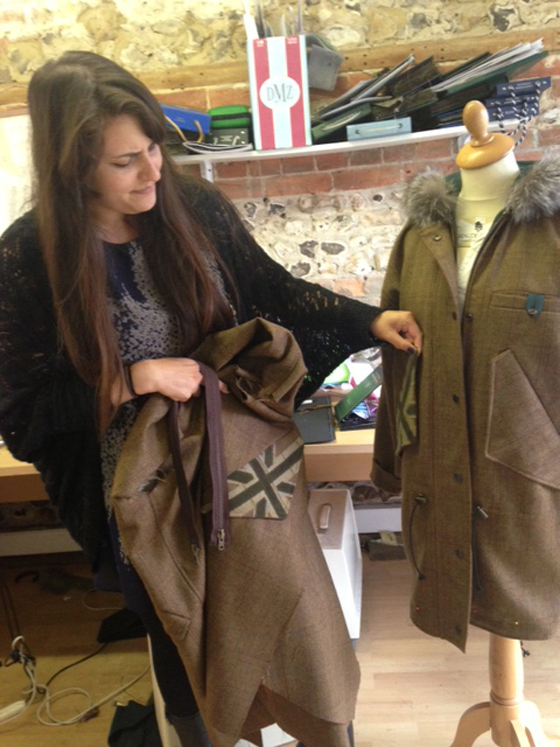 And making its debut at the CLA Game Fair this year was our brand new Nosy Parka. 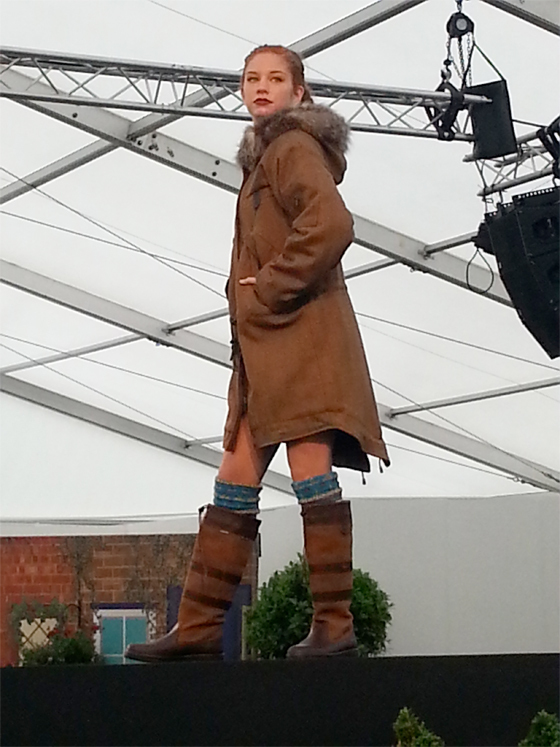 The ‘Nosy Parka’ is a new tweed parka from Maude & Fox and is pictured here making its catwalk debut at the recent CLA Game Fair. Thanks to everyone who visited the Maude & Fox stand at this years event. And to those who attended the daily fashion show which we were proud to support. The Nosy Parka is a traditional fishtail parka with our classic tweed twist. The tweed parka has a looser fit with drawstring details around the waist and tail. It’ll be the perfect parka for keeping warm once the 2014 A/W season arrives! More pictures and information on the Nosy Parka can be found here. Be the early bird and spring into March! 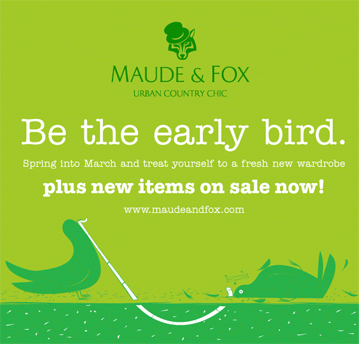 treat yourself to a fresh new wardrobe with contemporary tweed from Maude & Fox. We have new items on sale now, including contemporary clothes that can be worn by lad or laird alike. There has certainly been a chill in the air over recent weeks, but there’s no need to feel the cold. Stay toasty and tweed trendy in this women’s Aspen hoodie from Maude & Fox. Fashion model and Coronation Street star Helen Flanagan turns to the tweed trend for a recent shoot for Love It! magazine and recently posted the photo above to her Instagram account. At Maude & Fox we offer a complete tweed womensear range, including tweed skirts, Charlton coats, fitted waistcoats and tweed hoodies.